Is there anything better than juicy, tender, flavorful ribs? They’re a meat eater’s nirvana. 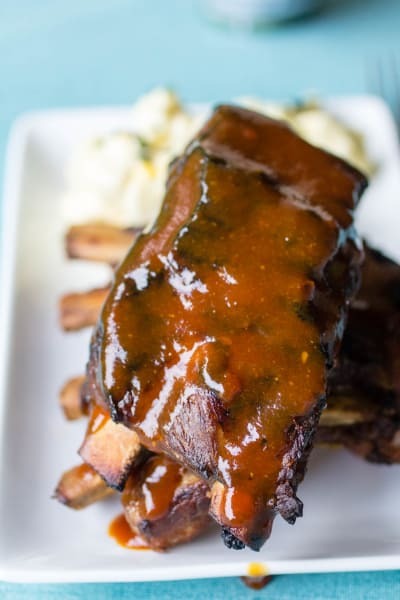 You can enjoy them at restaurant, but if you learn how to cook ribs at home, you can make them just the way you like. Just remember one thing. 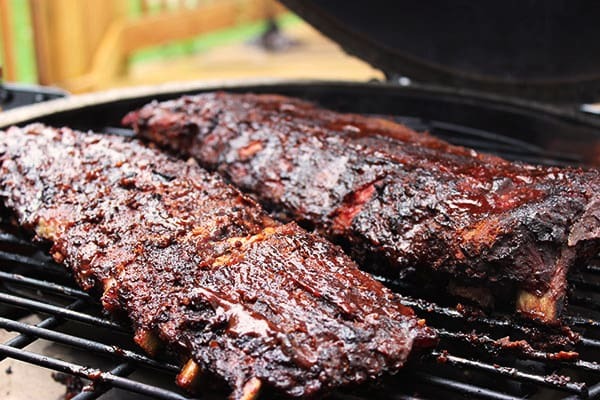 The best way to cook ribs is “low and slow,” meaning at a low temperature for a long while. You can make ribs in the oven, on the grill or smoker or in the slow cooker. Some people even use a combination of oven and grill. 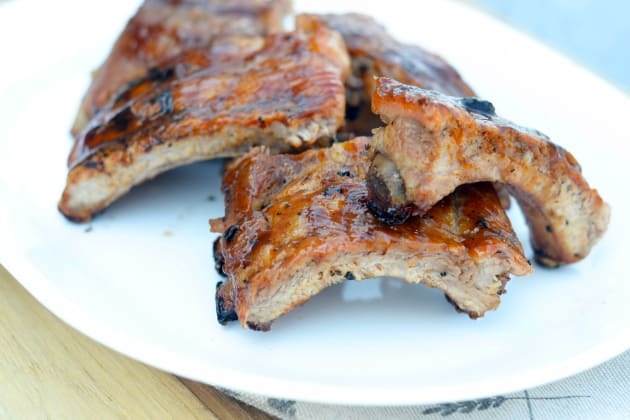 Place your pork ribs (baby backs or spareribs) on a baking sheet lined with parchment paper or aluminum foil (for easier cleanup). Here’s a great way to make fall-off-the-bone pork ribs on the grill. Prepare a dry rub by combining some paprika, dry mustard, chili powder, salt, black pepper, garlic powder, onion powder and cayenne pepper in a small bowl and mix well. Wash ribs and pat dry with paper towels. Remove the whitish-colored membrane on the back of the ribs. Use a butter knife to begin separating the membrane from the ribs, then pull the rest off with your fingers. Trim off any large pieces of fat but leave a little for flavor. Spread a thin layer vegetable oil all over ribs and then coat with the dry rub. 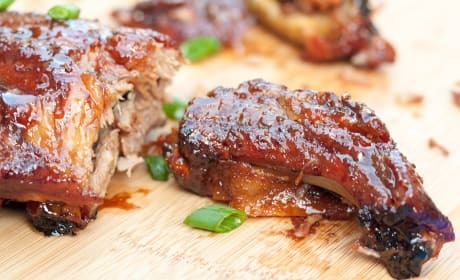 Wrap ribs with plastic wrap and let rest in the refrigerator from 1.5 hours – overnight. Remove the ribs from the refrigerator about 30-45 minutes before cooking. 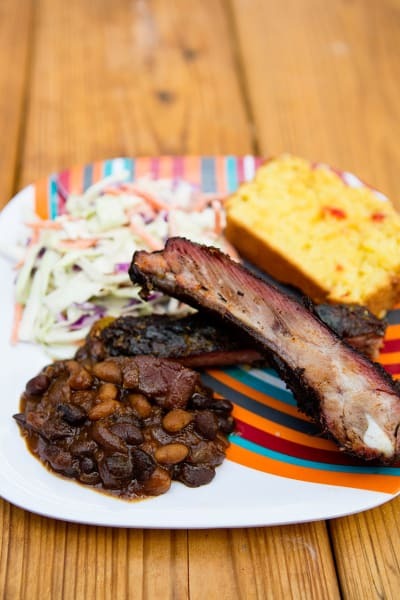 You want the ribs to be close to room temperature by the time they go on the grill. Meanwhile, preheat your grill to 225°F. If you are using a gas grill, just turn on one burner on one side. If using regular charcoal, go with several cups of lit coals and then pour another several cups of unlit coals on top. Set these coals up on one edge of the charcoal grill. Then grill the ribs on the opposite side to create the indirect heat needed to make delicious ribs. If you happen to have a smoker, then just adjust your vents to create a stable 225-250°F degree grill. Once the grill has reached a stable 225-250°F, you are ready to add the wood chunks. (Chips can work, but you will have to add them more often as they will burn faster.) Add a handful of chunks directly on top of the coals or right next to the burner. Put the ribs on the grill bone-side down, then close the lid and leave it closed! After about 3 hours, remove the ribs and wrap them tightly in aluminum foil with about 8 ounces of dark beer or apple juice. Return the ribs to the grill for another 2 hours at 225-250°F degrees. Brush a thick coat of BBQ sauce over both sides of the ribs, and then move the racks over direct heat for about 30 minutes. To test doneness, pick up one end of a rack with grill tongs. If the rack bends to almost 90 degrees, then it’s done. 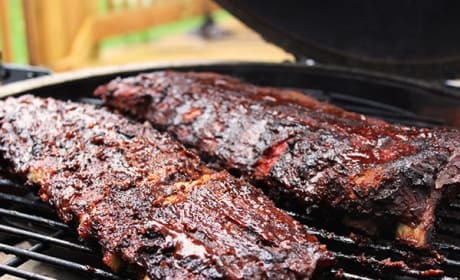 Once the ribs are done, allow them to rest a few minutes before serving. This editor’s go-to method for cooking ribs is using the Crock Pot. 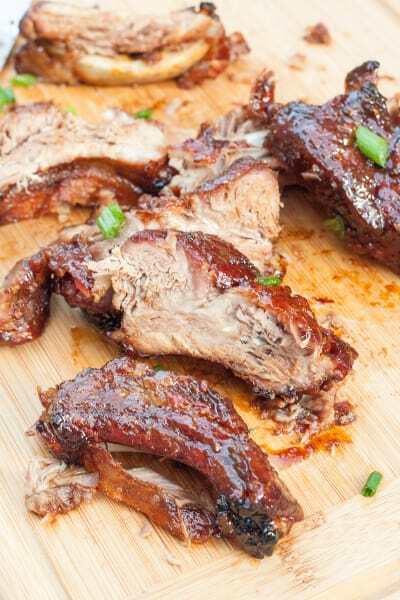 To make Super Easy Slow Cooker BBQ Ribs, place the ribs in a greased slow cooker and season them. Let the ribs cook for 8 hours on low. Add BBQ sauce during the last half hour of cooking. The ribs will be falling off the bone!